In this week’s episode of Brooklyn Nine-Nine, the show tackles tough conversations about prejudice and institutionalized racism when one of their own is stopped by a racist cop. Now that the Nine-Nine precinct has avoided closure, the team is settling back into their normal routines. Everyone, that is, except Terry, who has decided he wants to take on more responsibility. 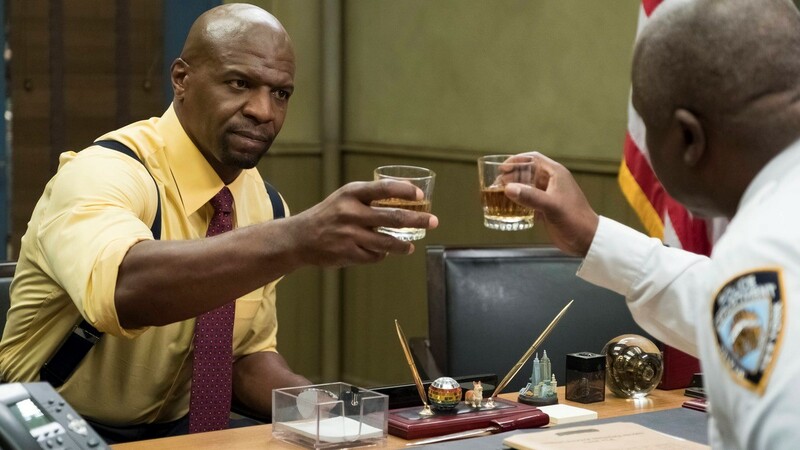 He asks Captain Holt, who readily agrees and tells Terry there’s an opening for City Council Liaison. Terry jumps at the chance but then learns the 96-page application and accompanying 4,000-word personal essay are both due tomorrow. In a panic, Terry realizes he’ll have to stay late to get the application and essay done, but that means he needs someone to pick up his twin girls, Cagney and Lacey, from school for him. His wife is out of town for the week and the sitter isn’t available until later, so Jake and Amy volunteer for the job, which sends Boyle into excited giggles about them playing mommy and daddy for the day. Jake and Amy borrow Terry’s minivan to pick up the girls and take them home, and everything goes seamlessly. They even let them play with the car windows on the drive home (because it might foster a life-long interest in mechanical engineering). Afterward, Jake and Amy go to the bar to congratulate themselves on a job well done, having now “conquered” child-rearing, which was so much easier than they’d expected. Just then, Terry calls in a panic asking where “Moo Moo” is. Moo Moo is Cagney’s blanket. Cagney told Terry she had the blanket in the minivan but it’s not there now. Amy and Jake realize Moo Moo must have flown out while the girls played with the windows. Terry tells them everyone knows you don’t let children play with car windows — it’s Parenting 101! Terry is pretty upset with them and still very stressed out about his application, but they assure him they’ll find the blanket. They’re pretty sure they know which street they were on when the girls started playing with the windows. After Terry hangs up the phone, he suddenly spots Moo Moo at the end of his driveway. Problem solved! As he bends down to retrieve it, a police officer walks up and asks what he’s doing. Terry turns around to explain but the officer tells Terry to put his hands up and drop the blanket. The cop won’t let Terry explain that this is his driveway and his house and his daughter’s blanket. He won’t let Terry get a word out at all and proceeds to frisk him. Finally, Terry’s able to explain that he’s a sergeant with the Nine-Nine and the cop looks him up and lets him go. The next morning, Terry is still upset about the whole incident and tells the team what happened. They’re angry that Terry of all people — who’s the friendliest, nicest guy in the world — would’ve been stopped for no reason, and they know it’s because he’s black. Jake is the most shocked of all, and proceeds to recount all the times he WASN’T stopped for doing things that were actually suspicious, like breaking into Boyle’s apartment wearing a hockey mask to prank him. Amy and Jake, however, are completely unprepared when Cagney and Lacey ask them right off the bat why Terry got in trouble with the police officer and if it’s because he’s black. Amy and Jake panic, not knowing how to respond and knowing they can’t call Terry since he’s in his meeting. They call Boyle instead, since he’s a parent, but he is absolutely no help. Next, they call Rosa, whose solution is to send the twins straight to bed even though it’s only 6:30 pm. Their next call is to Gina, who tells them to simply explain the “deep-rooted institutionalized racism that remains pervasive in this country to this day,” but do so in song so six-year-olds can understand. She even makes up the song for them. Not knowing what else to do, they call Scully and Hitchcock, but they say they can’t help because they’re too busy eating cake and watching a movie. This gives Amy and Jake the perfect idea — they’ll feed the girls cake and turn on a movie, thereby distracting them from any more tough questions. Meanwhile, Terry’s conversation with the officer is not going well. The cop refuses to admit he did anything wrong. He’s sorry for not knowing Terry was a fellow officer, but says that’s really Terry’s fault for not having his badge on him (even though Terry was off-duty and standing on his own property). Terry tries to explain that, cop or not, the officer shouldn’t treat anyone that way because Terry wasn’t doing anything illegal. He was simply walking, and that’s not a crime. The cop stands firm, saying he had every right to treat him the way he did. The next morning, Terry once again relays to the team what happened and tells them he has no other choice — he’s going to file an official complaint. They all assure him it’s the right thing to do and say they know Captain Holt will eat this guy for breakfast. But when Terry turns the complaint over to Holt, Holt tells him he’s not going to submit it because he thinks it’s a mistake. The team is confused by Holt’s reaction and encourages Terry to go talk with Holt after work to find out his reasoning. Amy and Jake volunteer to watch Terry’s kids again while he pays a visit to Holt. Terry shows up at Holt’s house, inadvertently interrupting a dinner party. Holt tells Terry that he’s just as furious about what happened as Terry is, but he’s afraid a complaint like this will backfire on Terry and jeopardize his career. Holt explains that there’s politics involved in being a cop and reporting on a fellow officer would have more of a negative impact on Terry than the other officer. Holt tells Terry to pick his battles and that his best recourse is to continue to rise through the ranks and, when he’s captain of his own precinct, to train his officers to never treat someone the way this cop did. Over at Terry’s house, Amy and Jake are prepared to load the twins up with cake and movies again but they’re not interested. They have more tough questions, asking Amy and Jake if being black is bad and if they’re going to get in trouble like daddy did. Jake and Amy panic and then realize they’re just going to have to answer Cagney and Lacey’s questions, no matter how tough they might be. After a rough start, they manage to answer the questions as best they can. Back at Holt’s house, Terry explains to Holt that, while he doesn’t disagree with Holt’s logic, racist cops like the one who stopped him are out on the streets right now, and waiting years to rise through the ranks before you can effect change isn’t going to solve the very real problems happening right now. Terry breaks down, saying that all he ever wanted to be growing up was a superhero and he’s always felt that being a cop fulfilled that. But right now, he doesn’t feel like a superhero. When he was stopped for doing absolutely nothing wrong, he couldn’t stop thinking about his daughters, and that one day when they’re grown, they could be stopped just like he was, looking for their child’s missing toy, and they won’t be able to play the “cop card” to get out of trouble. Terry says that he doesn’t care if it hurts his career. He’s going to file the complaint, even if he has to go over Holt’s head to do it. The next morning at the precinct, Captain Holt calls Terry over for a chat and apologizes to him. Holt explains that as a black, gay man encountering prejudice and injustice on a daily basis as a cop and never having a superior office who was on his side, he learned his only recourse was to ignore the hate and rise through the ranks. But, he says, that was advice for a different place and a different time. He worked that hard and rose to the rank of Captain so that he could make a difference and be a better leader than the leaders he had. And if he doesn’t back Terry, he’d be betraying the very thing he worked so hard to accomplish. So, he filed the complaint for Terry. Later that afternoon, Holt calls Terry into his office to let him know that he heard from City Council and Terry did not get the liaison position. Terry asks if it was because of the complaint he filed, but Holt says they’ll probably never know. Terry wonders if he shouldn’t have filed the complaint — if he could have done more had he gotten the liaison job. Holt says he doesn’t know, but one thing’s for sure — that cop will think twice before making another bad stop again, and that’s a win. Brooklyn Nine-Nine isn’t known for handling tough questions, but when they do, they do it with grace and humor. Terry Crews and Andre Braugher were perfection as they navigated some really tough scenes and conversations, never straying from the show’s signature humor — even while tackling one of the most difficult issues in this country.